Indian Premier League 2019 ~ is all entertaining, more so, with matches going down the wire, to the last over – to the last ball finishes ! There are many milestones set, records broken. Suresh Raina achieved the landmark of 5000 runs in IPL and he was followed by Virat Kohli, 5 days later. Chris Gayle in sublime form, stretched, clobbered, massacred bowlers to reach a great landmark – 300 sixers in IPL. No other batsman has managed to cross 200! The next best is A. B. de Villiers’ 193. IPL has provided great opportunity for many youngsters – new stars are born every day. Now Navdeep Saini impressed with his speed, while the show was stolen by Shreyas Gopal. There have been golden opportunities for Nepal, Afghan players as well. Nepal leg-spinner Sandeep Lamichhane was initially not a part of the long-list of 1122 players who had entered the Indian Premier League auction in 2018. He was, however, later included among the 578 players who eventually went under the hammer. The 18-year-old made history on Jan 2018 when he became the first cricketer from Nepal to sign for an IPL team. Lamichhane was bought by Delhi Daredevils (now Delhi Capitals), coached by Ricky Ponting, for his base price of ₹20 lakh. Lamichhane first made an impact at the U-19 World Cup in 2016, where he claimed a hat-trick in Nepal’s defeat of Ireland. Today at Jaipur, Rajasthan Royals captain Ajinkya Rahane chose to field first against Royal Challenger Bangalore in Jaipur. His opposite number Virat Kohli, captaining for the 100th time in the IPL, said that they would have wanted to bat first, but now have to focus on defending not so challenging total. The Royals made two changes, as Sanju Samson is out due to injury and Jaydev Unadkat is also benched. Stuart Binny and Varun Aaron replaced them. These are batsmen of such great stature that their emphatic dismissals stand out in memories. 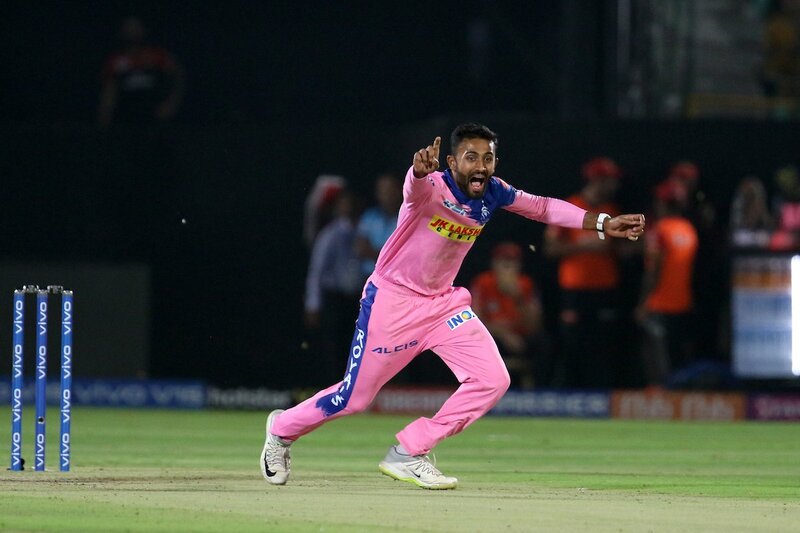 Shreyas Gopal could not believe his accomplishment today. In their clashes last IPL, Shreyas removed AB de Villiers twice and Virat Kohli once. Today he cleaned Virat Kohli, De Villiers tapped a tame one back to him, then followed with the wicket of Hetmyer to return an unbelievable figure of : - 4-1-12-3 ~ what a performance !! In last night match, midway through the 17th over of their chase of Kings XI Punjab's 166 for 9, Delhi Capitals were 144 for 3. Rishabh Pant was on 39 and Colin Ingram on 37. Mohammed Shami had the ball, and had just been clubbed over long-on for six off the third ball of the over. Next ball, Shami pegged Pant's middle stump back. The ball after that, Chris Morris was run-out. And Delhi were 144 for 5. Fifteen balls later, Delhi were all out. Sam Curran had bagged a hat-trick, spread over two overs, and we had the worst collapse for the last seven wickets in IPL history. The news of the day of IPL – is not happening on Cricket field, but miles away in the envious neighbour Pakistan – the news is : Pakistan bans IPL broadcast, says India ‘harming’ cricket in the country. "India made an organised effort to harm cricket in Pakistan and it doesn't make sense for us to allow an Indian domestic tournament to be promoted here," he said, pointing out that the official Indian broadcaster pulled out of the fourth edition of the Pakistan Super League (PSL) in the middle of the tournament after the Pulwama attack "to harm the league and cricket" in Pakistan. Information Minister Fawad Chaudhry told a press conference that the decision was taken at a Cabinet meeting chaired by Prime Minister Imran Khan, a former captain of Pakistani cricket team. Pakistan on Tuesday banned the telecast of Indian Premier League (IPL) cricket matches in the country, alleging that India has made an “organised effort to harm” the game in Pakistan. He said the move was taken by the Cabinet because India left no opportunity to harm Pakistan’s cricket. In February, DSport — the official broadcasters of the PSL in India — stopped the coverage of the tournament in protest of the Pulwama attack that killed 40 CRPF personnel. Indian company IMG Reliance also pulled out of its deal to produce the television coverage of the PSL worldwide forcing the Pakistan-based T20 league to find a new production company midway into the tournament. Chaudhry said the Pakistan Electronic Media Regulatory Authority (Pemra) would ensure that no IPL match is aired in Pakistan. He said the Pakistan government believes that sports and culture should not be politicised, but accused that India adopted an aggressive posture against Pakistani players and artists. Khan, who led Pakistan to victory at the 1992 Cricket World Cup, became Pakistan premier last August when his Pakistan Tehreek-e-Insaf (PTI) won the general election. Update : Rajasthan Royals, riding on four dropped chances, hardly let the foot off the gas, starting their chase quickly before Jos Buttler, Steven Smith and Rahul Tripathi, who finished on an unbeaten 34, took them to the target with a ball to spare. It was a more convincing win than that margin would suggest. Steve Smith coming after the International ban, made his first substantial contribution ; the Australian was busy at the crease, used his shuffle to unsettle the bowlers, ran hard between the wickets and found the occasional boundary. He made 38 and hit two boundaries and a six in his 31-ball knock. Rahul Tripathi ensured there was no drama in the end, as he calmly pulled Umesh over square leg for six to give his side their first points of the season. The star-studded RCB is yet to gain one ..